Prachee Shah, a Masters in Kathak and Guinness World Record holder for '93 kathak spins in one minute' Prachee Shah-Paandya is an exponent of Jaipur Gharana, and the disciple of Guru Ganesh Hiralalji. Wedded to Kathak since the tender age of three, Prachee has given over 250 performances in India, USA, UK and South Africa and more, and at many prestigious platforms such as Ajanta-Ellora festival, Kala Ghoda Festival and South African International Art festival. Her accolades include awards like "Srinagarmani" and "Nitya Urvashi". The prodigious son of Pandit Bhajan Sopori, Abhay Rustum Sopori carries the essence of iconic Sufiyana gharana in his DNA. He has learnt music under his grandfather, Pandit Shambunath Sopori and his father Pandit Bhajan Sopori. Abhay has participated in prestigious festivals all across the world, has more than 35 releases to his name. Abhay has composed music for many national and international films. A musician, a musicologist, a teacher, a writer and a poet; Pandit Bhajan Sopori was born into the family of fabled 300 years old Sufiyana gharana, and the only exclusive traditional Santoor family in the country. He is the first person to play the Indian classical music on Santoor, and since 1950's he has been instrumental in establishing the eminence of Santoor in the Indian classical music. He has composed over 5000 songs in almost all Indian languages and many foreign languages. A celebrated voice of Kolkata, Pandit Tushar Dutta, was born in a musical family. 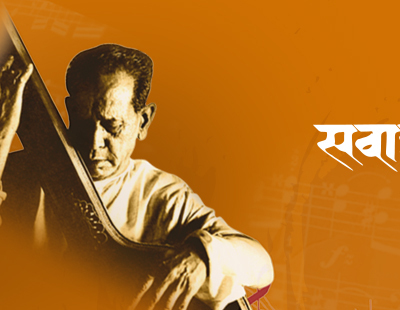 He has been tutored by Pandit Bimal Mitra, by exponents of Kirana gharana Pandit A. Kanan and Pandit Arun Bhaduri, and later by Pandit Sunil Bose and Pandit K.G. Ginde of the Agra gharana. Such a diverse and disciplined Taalim distinctly reflects in his music through a mellifluous blend of Kirana and Agra Gharana. He is a "Top Grade" All India Radio Artiste, a prominent voice in Bengali cinema, and an artiste who has more than 50 recorded albums to his name. Arati Ankalikar-Tikekar trained under Late Pandit Vasantrao Kulkarni and AGana Saraswati Smt Kishori Amonkar of the Jaipur Atrauli gharana. Endowed with a rich resonant voice, Arati's performances are marked by an excellent command over both the rhythm and the melody. Arati has performed at many prestigious conferences in India and abroad and has tried to promote Indian Classical Music and Culture in different parts of the World. She has received numerous awards including Pt.Kumar Gandharva Sanman, Pt. Jasraj Award, Maharashtra State Award for best playback singer and V.Shantaram Award. Upendra Bhat, an acclaimed classical vocalist of Kirana Gharana, reminds the audience of his legendary Guru - Pandit Bhimsen Joshi. With his well seasoned, sonorous voice, systematic rendition of ragas, powerful taans and expressive singing, Upendra keeps the audience captivated. He excels in diverse musical genres like gazals, thumris, bhajans and light music. Upendra has performed at several prestigious platforms like Harivallabh Sangeet Sammelan, Sawai Gandharva Music Festival, in India, UK, USA, Dubai and Bahrain. Padma Talwalkar's music represents a unique blend of various Gharanas, embellished with her own personal touch. She inherited her talent from kirtankar grandfather, Shri Kanebuwa. She mastered the intricacies of Gwalior and Kirana Gharana from Pandit Gnagagharbuwa Pimpalkhare, was under tutelage of Late. Smt. Mogubai Kurdikar of Jaipur Gharana and perfected the art of concert singing from Smt. Kishori Amonkar. Padma continued her quest for music under the guidance of Pt. Gajananrao Joshi, a master of Jaipur, Gwalior and Agra Gharanas. Her impressive list of awards includes Late. Smt.